When we turn on the TV or open up a magazine we are bombarded with different ads for food. Most of these foods are advertised as being healthy with words such as “low fat” or “high fiber.” As a consumer, it can be so overwhelming! One of the new trends has become advertising food as being a whole grain product or high in fiber. Does that mean that all brown bread is whole grain or that Trix is healthy for me because it says whole grain on the box? A whole grain contains the entire kernel of grain which is: the germ, bran, and endosperm. The grain can be cracked or crushed, but to be considered a whole grain the end product needs to have 100% of the original kernel. Most products that are processed are missing the entire bran component. Why should I eat whole grain products? Research has shown that when we regularly eat whole grains instead of processed grains there is a link between : having a healthy weight, improving cholesterol levels, lowering blood pressure, reducing the risk of heart disease and type two diabetes, and can help prevent certain cancers! How much whole grains do I need? It is recommended that we consume at least half of our grains from whole grain products. That would mean that adults would need about three to five servings of whole grains and that children would need about two to three servings. A serving of whole grains is defined as 16g of a whole grain food. There seems to be a perception that adding whole grains would add to an increase in calories and/or carbohydrates in our diets. But, as you can see, it’s really more that we are substituting whole grains for processed grains. 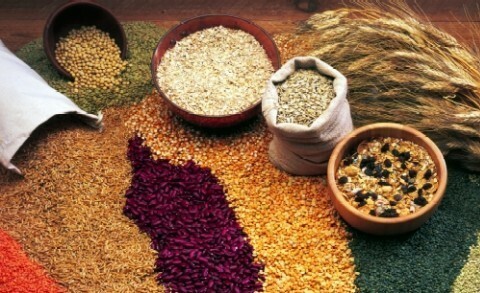 One of the benefits of whole grains products is that they also have fiber. Fiber helps keep us fuller for a longer period of time, so if you’re trying to lose weight whole grains would actually help! Where can I find whole grains? It is easier than you think to add these whole grain products to your diet! You can always start by slowing switching products out such as eating half white rice and half brown rice. There are so many health benefits to incorporating whole grains into our diets, and as a consumer you are know more aware of how to find these products. So don’t be scared to go into the “health food” section of your grocery store and pick up some quinoa or buckwheat.